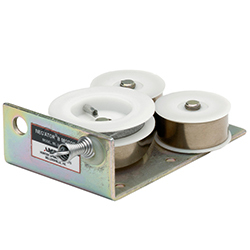 NEG'ATOR spring motor assemblies are composed of single or double NEG'ATOR constant force springs mounted on either one or two storage drums and a single output drum with an integral cable reel. The entire assembly is mounted on a metal base plate. These complete assemblies can be readily installed in a product using the mounting holes provided, and can deliver either linear or rotary force. Our spring motor assemblies are made of type 301 High Yield Stainless Steel. Other materials including Elgiloy, Inconel, or high-carbon steel can be used upon request for custom applications. We offer spring motor assemblies as custom design solutions. Use our design worksheet to specify your requirements and allow our Application Engineers to design a spring motor assembly that meets your specific needs. We also offer standard spring motor solutions. Click on our Selection Guide below for more information about specific models.